“Hands Up, Don’t Shoot.” Photo from a Washington DC protest. Photo by David Shen. In the wake of Ferguson, Black Friday takes on a whole new meaning. I recall with stunning clarity that day in 1992 when the Rodney King beating verdict came down. An all-white jury in Simi Valley pronounced that a gang of police officers was not guilty for beating an unarmed black man nearly to death, despite the fact that a bystander caught the whole ugly incident on video. For those of you who were born in the 80s or 90s, it may be difficult to understand what it meant to have caught the beating on video. Back then, people didn’t walk around with cameras in their pockets like we do today. We didn’t have watchdog groups teaching citizens about how to film the police. For police brutality to be clearly caught on tape felt as rare as snagging video of the Loch Ness monster or a clear shot of Bigfoot running in the forest. Finally! Black people could show the whole world that the monster was real. When the verdict came in not guilty, I was enraged, but underneath I was deeply devastated. We had thought, “If only white people could see what we see, day after day, in our communities, they would help.” But that not guilty verdict of that jury taught the country a bitter lesson: the black man in the center of a ring of armed men, as the nightstick blows rained down on his body, as his bones cracked and blood vessels burst and the breath was kicked from his lungs, would always be considered the monster in the eyes of white supremacy. When an Oakland transit police officer shot Oscar Grant nearly 20 years later, we lived in a technological era where multiple cameras captured his death. The videos show that Grant was unarmed, handcuffed man and lay face down on pavement. And yet a jury still found that the officer was not of murder or manslaughter. 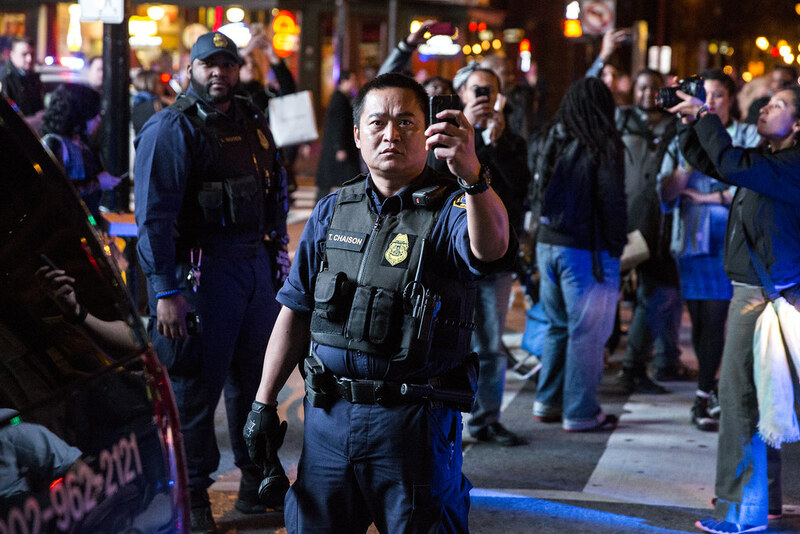 A police officer films a Ferguson protest in Washington, DC this week. Photo by Russell Brammer. In the death of Michael Brown, there is no video footage showing what happened. In fact, this case has led to widespread calls for police themselves to wear body cameras to document cases such as this one. For now, we are left with police accounts that become official record, in spite of widespread inconsistencies. MSNBC legal analyst Lisa Bloom skewered the grand jury proceedings, “So many missed opportunities for cross examination of Wilson. Should have been a grueling session, not the tea party the transcript shows.” A day after the grand jury declared that Officer Darren Wilson will not be tried for Brown’s murder, Wilson was on primetime TV saying he would have done nothing differently in the incident. His word becomes reality. When young black men are shot by police, the individual evidence matters less than their trial by public opinions. The fatally shot men are discredited and blamed for their own brutalization while the officers are supported for their “bravery.” In all of these cases, the news of the police not being punished sparked protest, and in all cases, there would be massive police retaliation against protestors—both those who were clearly non-violent as well as those suspected of violence. By the time the dust settled, the story of the original shooting death would be drowned out. While families still carried fresh and heavy grief for their lost or brutalized sons, the so-called riots would take center stage as the story. So on the surface, it’s the same old thing. A murder, a response, a repression, a not-guilty verdict. In the face of all this, it’s easy to feel hopeless. If even video footage and public outcry don’t make a difference in our justice system, what can we do to be heard? This year, as America continues with business as usual in the courtroom, many black people are determined that the holidays won’t see business as usual in the economy. Shortly after the announcement of the verdict, Black Twitter exploded with #HandsUpDontSpend, a spinoff of the hashtag #HandsUpDontShoot that trended after the killing of Michael Brown. African Americans are calling for a boycott of mainstream US retail outlets in favor of black-owned businesses. With hashtags like #NotOneDime, they are calling for the boycott to last from Black Friday through Cyber Monday and to end on December 2nd. A Ferugson protest in Memphis after the grand jury indictment news this week. Photo by Chris Weiland. The origins of the term Black Friday come from the dread that many felt about the traffic jams and pedestrian congestion from the start of the holiday shopping season. However, major retailers have attempted to rebrand the name to reflect the fact that the holiday shopping is what takes many retailers from red ink (losses) to black ink (profits). This year, however, for black people, the Black in Black Friday is an opportunity for the Black to be about our communities rejecting business as usual. #BlackOutBlackFriday and #BoycottBlackFriday are popping up. We and other people of color have decided to reach into our legacies of using our economic power: the Montgomery Bus Boycott in the Civil Rights Movement, the grapes boycott of the United Farm Workers, and other historical boycotts. I find these movements toward boycotting very moving and hopeful. They reflect a positive action that people of color and our white allies can take in this moment where we feel helpless to get the justice Michael Brown and our communities deserve. Of course, not shopping on Black Friday isn’t going to solve racism in the United States. But it’s a powerful teachable moment for our communities in identifying that our participation in American consumerism is an act of propping up American racism. White supremacy plays out in the streets as shooting deaths of young black people by police. But white supremacy plays out in the boardrooms and courtrooms and assembly rooms as white-owned corporate and private wealth being consistently consolidated, prioritized and protected by all structures of the society. I’m encouraged by watching our community make these connections. 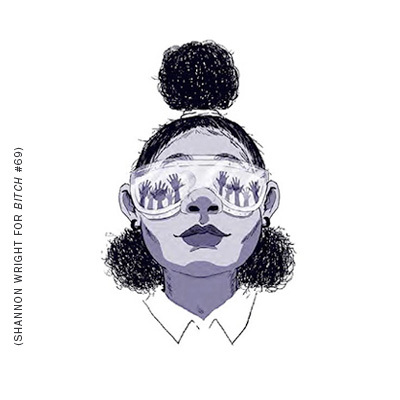 As Kara Stevens, the Frugal Feminista, put it in a recent Popaganda podcast, consumerism tries to convince us—particularly black women—that the solutions to out deepest challenges can be found through shopping. What black people most deeply desire this year is a world where we don’t have to worry about our children being shot by police, and if, God forbid, it did happen that we could get justice. We want a world without racism, without the prison industrial complex. We want a world without sexual and domestic violence and hate crimes. We want a world without colonization. This is what we most deeply desire. And I’m confident it can’t be found at any outlet mall. #BoycottBlackFriday. "Him, Me, and Muhammad Ali" is the new book from the author whose books center on sexuality, language, and class.